As international travel from the U.S. reaches an all-time high, more credit card issuers than ever are getting rid of foreign transaction fees. 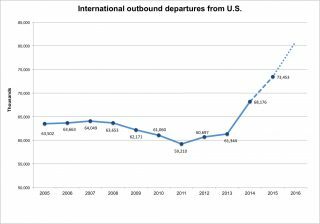 Last year, Americans made a record 73 million international departures by air and other modes of transportation, says Richard Champley, a senior analyst at the National Travel and Tourism Office, part of the U.S. Department of Commerce. “It looks like 2016 might be another record-breaking year,” says Champley, referring to the early data from this year, which show a 10.1% increase in outbound international departures compared with 2015. As travel has boomed, we’ve also started to see foreign transaction fees disappear from credit cards. Issuers tack these fees — usually 1% to 3% of the amount charged — onto purchases made outside the U.S. In the past three years, each of the 12 largest credit-card-issuing banks has either introduced a new credit card with no foreign transaction fees or eliminated such fees on an existing card. If these trends continue, foreign transaction fees on credit cards may soon become a thing of the past. International travel doesn’t increase every year like clockwork; it has its bumps and slumps, which make the sustained gains of recent years a big deal. And the increase isn’t all business travel; in fact, business travel has softened in recent years. Instead, surveys by the National Travel and Tourism Office show that vacationers have been a leading contributor to the steady climb in travel numbers. In addition, Champley notes, the data indicate that the increase in trips is due to an increase in the number of travelers, rather than people taking more trips per year. These travel data include people traveling overseas by air and other modes of transport and those traveling to Mexico and Canada by ground transportation. Banco de Mexico and Statistics Canada contribute numbers on the latter; if their data from last year are revised, the 2015 numbers (represented by the blue dashed line) might change. The dotted blue line on the chart above represents the growth we might see if current trends continue through the end of this year. This increase in international trips has contributed indirectly to big changes in the credit card industry in recent years, as demand for cards without foreign transaction fees has risen. Not that long ago, finding a credit card with no foreign transaction fee sometimes meant going with a card that wasn’t your top pick. In 2010, a Pew Trust study found that 91% of credit cards issued by the largest 12 banks in the country had foreign transaction fees, and the median fee was 3%. Today, the landscape has changed. Using the same methodology described by Pew, NerdWallet found that only 57% of the credit cards issued by today’s 12 largest banks currently have foreign transaction fees, though the median fee remained the same. Among travel credit cards, these fees have almost entirely vanished. Getting rid of foreign transaction charges could be lucrative for issuers, many of which earn the bulk of their credit card revenue from interest, not fees. In fact, a composite income statement from First Annapolis Consulting with data from major credit-card-issuing banks showed that interest earnings brought in twice as much money as all earnings from service fees (including foreign transaction fees) and interchange fees. Some issuers may also be trying to woo high-income cardholders, who tend to both travel more frequently and bring in more revenue than the average cardholder. In fact, American households in the top 20% of income reported spending money on airline fares at twice the rate of all households in data collected in 2014 by the Bureau of Labor Statistics. When cardholders spend more, issuers make more in revenue. A few years ago, Chase got rid of the 3% fees on its United℠ Explorer Card. Today, none of the issuer’s travel cards has a foreign transaction fee. Recently, USAA announced it would eliminate foreign transaction fees on all of its cards this year. It made the change for active duty military cardholders serving abroad and members who enjoy traveling internationally, USAA Vice President Matt Bruhn said in a statement to the San Antonio Express-News. Navy Federal Credit Union, which also serves military families but isn’t among the 12 largest issuers, made the same move earlier this year. Some issuers set the stage for the shift away from these fees early on. Capital One, for example, has always had a no foreign transaction fee policy, says a Capital One spokesperson. And Discover stopped charging the fees in 2011, after a post-recession slump in international travel. This isn’t the first time issuers have been locked in a benefits arms race, and it won’t be the last. Consider what happened in 2013, when Capital One started offering a no-fee, flat-rate 1.5% cash-back card. Since then, Barclaycard, Chase and Wells Fargo have followed suit. Citi even released a flat-rate cash-back card with a rate higher than 1.5%. What happened with flat-rate cash back is happening with foreign transaction fees right now, and it’s benefiting international travelers. In fact, a recent analysis by NerdWallet showed that even if you travel overseas only once per year, a travel card without foreign transaction fees would now be a better deal than most cash-back cards because of the richer rewards and lack of fees abroad. The average overseas traveler charges about $816 to his or her credit card abroad on each international trip and takes 2.6 trips overseas per year, based on 2014 survey data from the travel and tourism office, the most recent available. If he or she could avoid paying the median foreign transaction fee on every overseas purchase, the savings would add up to roughly $64 per year. In an economy where the dollar is strong, that money could go a long way. Travel might not continue its steady rise. It goes in cycles, Champley says. In general, the increase in international travel is related to a strong U.S. dollar, income growth, increased gross domestic product, more airlines traveling to more destinations and marketing programs targeted at U.S. travelers, he notes. It will likely decline at some point, say, in a future credit crunch or in the case of an economic downturn. But the increase in international travel for now, it seems, might be enough to make some issuers want to ditch foreign transaction fees on credit cards for good. No foreign transaction fees may soon be the new normal.